DERA ISMAIL KHAN, Pakistan -- Security forces killed the alleged planner of the recent deadly attack on a school, and a suspected U.S. drone fired missiles at two compounds in Pakistan's North Waziristan tribal region, killing at least seven alleged militants, Pakistani officials said. A top government official in the Khyber tribal region said security forces, acting on intelligence information, conducted a raid in the Bara area late Thursday night, where they fought a gun battle with the militant commander known as Saddam and his accomplices, said Shahab Ali Shah, head of police administration in Khyber. Shah said that Saddam was killed in the hour-long shootout, while his six accomplices were injured and arrested. He said Saddam helped plan the Peshawar school attack and was also involved in attacks on health workers giving polio vaccinations in the Peshawar valley. 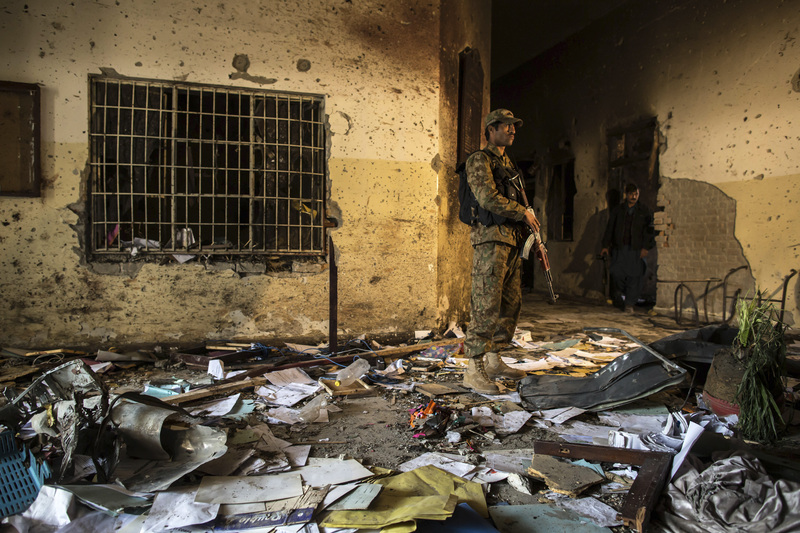 On December 16, militants strapped with explosives broke into a military-run school in Peshawar, the capital of Khyber Pakhtunkhwa province, and killed 148 people, most of them children. Intelligence officials said the drone strikes, early Friday morning, hit the compounds of the Punjabi Taliban and a group of Uzbek militants in the Shawal area of North Waziristan. Two missiles struck the compound of the Punjabi Taliban in the village of Kund, killing four militants, the officials said. They said the compound was being used as a training facility by the group's commander, Qari Imran, but it was unclear whether Imran himself was present at the time of attack. The officials all spoke on condition of anonymity because they were not authorized to brief the media. Minutes later, another drone-launched missile struck the compound of a group of Uzbek militants in the village of Mangrotai, killing three alleged militants, the officials said. Drone strikes are largely unpopular in Pakistan where many consider them a violation of the country's sovereignty and resent the collateral damage caused to Pakistani civilians. But the U.S. insists these attacks are effective to eliminate militants in areas inaccessible to the Pakistani military. The Reuters news agency explains that the drone attacks "The attacks took place in the same area where the Pakistani army has been mounting an air-and-ground operation against Pakistani Taliban insurgents who are fighting against the government in order to set up a sharia state in Pakistan. "Areas along Pakistan's porous border with Afghanistan are home to a range of domestic and foreign militants and the authorities have been under pressure to do more to eliminate the insurgents who cross into Afghanistan and stage attacks there. Pakistani Taliban are based on both sides of the border."